Boa Mistura presents Spread Love, It’s The Brooklyn Way, an exhibit at Open Source Gallery in conjunction with a series of murals throughout South Slope, Brooklyn. 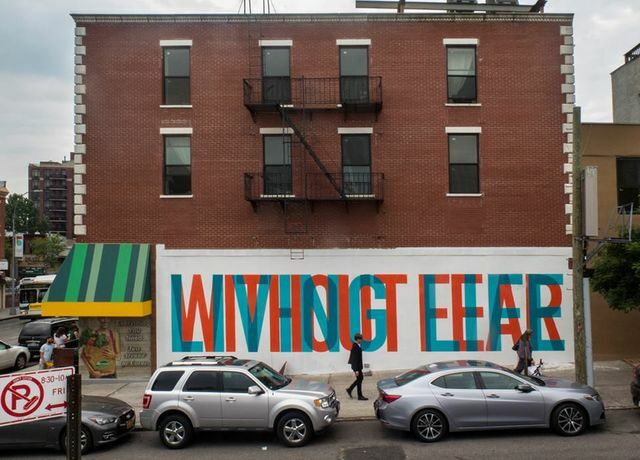 This past June Spanish art collective Boa Mistura created four murals in South Slope, Brooklyn with the help of a diverse group of volunteers from across NYC. Boa Mistura, well-known for creating projects worldwide that build and transform communities, brought their talents to Brooklyn for the first time to beautify and unite our neighborhood. The enthusiasm of the young artists and the commitment of the volunteers made Spread Love, It’s The Brooklyn Way an incredible celebration of collaboration and community that will to continue to spread love. Spread Love, It’s The Brooklyn Way depicts lyrics and quotes by Christopher Wallace, aka The Notorious B.I.G., an artist born and raised in Brooklyn. Hip hop in engrained in the history of Brooklyn and this project aims to serve as a connection to the history of the borough and prompt a conversation about the role of residents and neighbors in preserving it and moving their communities forward. Through cooperation with residents of Brooklyn, Boa Mistura generated conversation about what the borough means to its residents and its visitors, providing a catalyst for the neighborhood to explore their identity and celebrate the aesthetic value of neglected aspects of the neighborhood. At the gallery, Boa Mistura exhibits silkscreen prints alongside video of the mural project. The video, created by Mark and Jack Chandler, documents the process of making the mural, including interviews with the artists. Within this exhibit, the community is invited to continue the conversation that Boa Mistura began with their murals.